Will Apple embrace 1080 video on iPad 3 and Apple TV? In all likelihood, Apple’s media event on March 7 will introduce a new iPad. We’ve even speculated what we might expect from next week’s event. I’ve been thinking of the ramifications of the iPad gaining a Retina-style display. (That’s what Apple calls the screen it debuted on the iPhone 4, with a pixel density so high that the human eye can’t distinguish the individual pixels.) When you put it all together, it suggests that March 7 could be the day that Apple ramps up its support of high-definition video—if it thinks it’s worth it. The iPad 2’s ( ) screen resolution is 1024 by 768 pixels (at 132 pixels per inch). So let’s imagine that Apple doubles the iPad’s 1024-by-768 pixel dimensions to 2048-by-1536 pixels resolution, an act that creates a device with four times as many pixels. Such a screen would be drop-dead gorgeous for looking at photos and reading crisp text, sure. But it would also allow the iPad to display every pixel of the highest-resolution home video format: 1080p (1920 by 1080) movies. 1080p is the resolution that you’ll find on Blu-ray discs and some video-on-demand services—and it’s what the video mode on the the iPhone 4S shoots in, to boot. 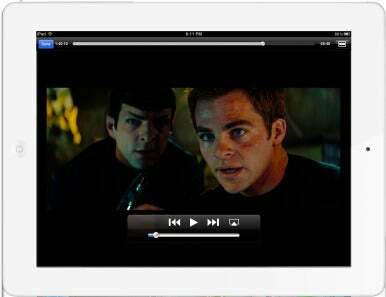 Right now the HD video content on iTunes is 720p (1280 by 720) resolution. Although both the iPad and iPhone can technically play H.264 1080p video, the displays on those devices aren’t big enough to display the full resolution in the proper aspect ratio. And the Apple TV ( ), which is designed for connecting to HDTVs, can’t play back videos with higher resolutions than 720p. So if Apple’s going to release an iPad with so many pixels that it can fit the entire contents of a 1080p video on screen with room to spare, perhaps it’s the right time to add 1080p video to the iTunes Store. Alongside all the swirling iPad rumors have been suggestions that there’s also a new Apple TV in the offing. Add in the fact that the iPad can stream content to an Apple TV using AirPlay, and you have a nice little ecosystem for Apple to offer higher quality video (and entice people to upgrade several devices at once). A 1080p movie would fit on a retina iPad screen with room to spare. There are some lingering issues, however. Take bandwidth. An as example, Martin Scorsese’s Academy Award-winning movie Hugo is now available to purchase from the iTunes Store. The SD version is 1.74GB, while the 720p HD version weighs in at 3.99GB. 1080p is 2.25 times as many pixels as 720p, so all things being equal (understanding that things like audio tracks might not scale up in the same way) the same movie in 1080p would tip the scales at nearly 9GB. That’s a lot of data to download (especially in these days of bandwidth caps from most major ISPs). It would also take a long time to download, and eat up a lot of storage space. To combat this, Apple could go the route of cable and satellite providers, which highly compress HD video (and often cut resolution of HD content from 1920 by 1080 to lower resolutions to save bandwidth). That doesn’t feel very Apple to me. And if Apple offers SD, HD, and Super HD, will that mean you’ll be forced to download all three the way iTunes makes you grab both the SD and HD version now? And if Apple added a third quality tier, would it add an additional price tier too? Hugo costs $15 to buy in SD and $20 to buy in HD. What would a Super HD version cost, $30? Is anyone willing to pay that? Which leads me to the real question: Can the average iTunes customer even tell the difference between 720p and 1080p, either on an iPad or on an Apple TV? Apple has become the biggest music retailer in the United States selling 256-kbps compressed audio, due in part to convenience but also to the fact non-audiophiles—listening to music on headphones or middle-of-the-road speakers—can’t really tell the difference. We’re not talking about the difference between standard-definition video and high-definition—this is the difference between two high-definition video formats. With the exception of a few high-end home-theater fans, will anyone notice? March 7 might indeed see Apple embracing 1080p video everywhere in its ecosystem. But even if it happens, I’m not sure the difference in time, bandwidth, cost, and storage space will be worth a slight upgrade in quality. Apple invited members of the media to a special event on March 7 at 10 a.m. Pacific.